Kemberly Richardson has more on the events from Union Square. FERGUSON, Mo. -- One year after the shooting that cast greater scrutiny on how police interact with black communities, the death of 18-year-old Michael Brown in Ferguson, Missouri, was marked Sunday with 4 minutes of silence. A crowd of hundreds that had gathered to commemorate Brown began their silence at 12:02 p.m., the time he was killed, and the length of time was to symbolize the 4 hours that his body lay in the street after he was killed. Two doves were released at the end. A march was to start at the site where Brown, who was black and unarmed, was fatally shot by Ferguson officer Darren Wilson on Aug. 9, 2014. A grand jury and the U.S. Department of Justice declined to prosecute Wilson, who resigned in November, but the shooting touched off a national "Black Lives Matter" movement. A service commemorating the anniversary was also planned at a Ferguson church, among several events this weekend in Ferguson and nearby St. Louis. Crowds gathered throughout the weekend in Ferguson, Mo. to mark the anniversary of the death of 18-year-old Michael Brown. In Brooklyn, a sea of people laid down motionless on a pavement to mark the anniversary. Demonstrators maintained their silence on Sunday for a few moments before rising and joining others marching from the Barclays Center arena into Manhattan for another rally later in the day. Among those marching were a dozen people carrying a giant banner reading, "Black Lives Matter." The death of Brown was among the catalysts of a national movement calling for change in the relationships between police and minority communities. Another of the catalysts was the death of Staten Island resident Eric Garner, a black man who died in July of last year after being restrained by a police officer. 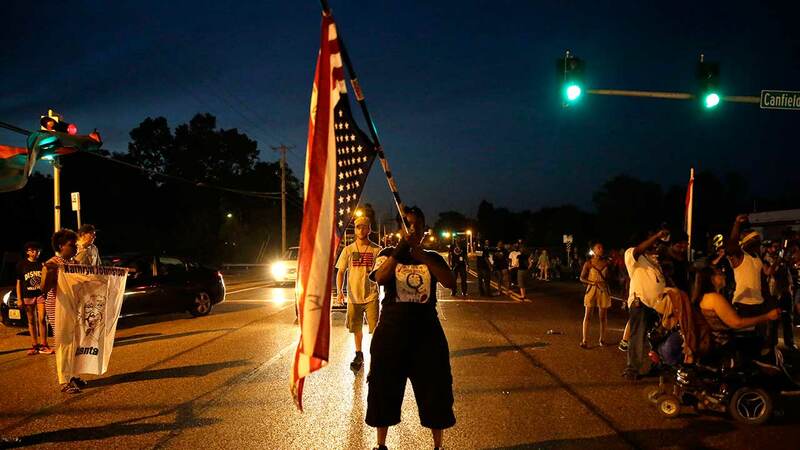 Brown's father, Michael Brown Sr., led a parade involving several hundred people on Saturday. Brown said his family is still grieving, but he believes his son's legacy can be seen in the increased awareness of police shootings, and renewed skepticism when officers describe their side of events leading up to those shootings. Some people who marched in the Saturday parade wore T-shirts with likenesses of Brown or messages such as "Please stop killing us" or "Hands up! Don't shoot!" which became a rallying cry during the sometimes-violent protests that followed the shooting a year ago. Some carried signs or wore shirts commemorating others who have been killed in confrontations with police. But the focus of the weekend is largely on Brown, who graduated from high school weeks before the shooting and planned to go to trade school to study to become a heating and air conditioning technician. Relatives and friends described Brown as a quiet, gentle giant who stood around 6-foot-3 and weighed nearly 300 pounds. But police said Brown stole items from a convenience store and shoved the owner who tried to stop him on the morning of Aug. 9, 2014. Moments later, he and a friend were walking on Canfield Drive when Wilson, who is white, told them to move to the sidewalk. That led to a confrontation inside Wilson's police car. It spilled outside, and Wilson claimed that Brown came at him, menacingly, leading to the fatal shooting. Some witnesses claimed Brown had his hands up in surrender. Federal officials concluded there was no evidence to disprove testimony by Wilson that he feared for his safety, nor was there reliable evidence that Brown had his hands up in surrender when he was shot. The shooting led to protests, some violent, and the unrest escalated again in November when a St. Louis County grand jury determined that Wilson did nothing wrong. He resigned days later. The November riots included fires that burned more than a dozen businesses. The Justice Department reached the same conclusion in March, clearing Wilson. But in a separate report, the Justice Department cited racial bias and profiling in policing as well as a profit-driven municipal court system that often targeted black residents, who make up about two-thirds of Ferguson's populace. Ferguson's city manager, police chief and municipal judge resigned within days of that report. All three were white. The new judge, interim city manager and interim police chief are all black.